Vigorously singing its monotonous chip-chip-chip song from the top of a spiky spruce, this Chinese Leaf-Warbler (left) typifies the family. It is a small, plain, rather drab but restless little bird whose vocalizations make it much easier to identify than anything in its plumage. As it happens, Chinese Leaf-Warbler is a newly described species, discovered and split from the Pallas's/Lemon-rumped Warbler group on the basis of its distinctive song and calls (Alström, Olsson & Colston 1992). It breeds in a few forested mountains outside of Beijing; its winter range and migration routes are virtually unknown because it is almost impossible to identify when silent. It was initially named Phylloscopus sichuanensis (Alström et al. 1992) but recent evidence shows that the older yunnanensis has priority (Dickinson 2003). There has been a history of nothing but confusion about this tiny bird! The Phylloscopidae is comprised of many small tree-loving warblers. Many are canopy or sub-canopy species, gleaning insects from leaves. Many are long-distance migrants. Many are also rather plain little birds — in muted tones of green, yellow, or brown — and identification can be difficult. One very widespread species is Common Chiffchaff (right, in a nice shot by Blake Matheson). It has a nice onomatipedic name for its breeding season song. The identification of Phylloscopus warblers — birders tend to call them "Phylloscs" — has been the subject of much Holarctic literature. Some of the classic older works are Ticehurst (1938) and Williamson (1976); material on more specific species includes that by Dean (1985) and Madge (1987). The exact parameters of the Phylloscopidae is not yet known. There are at least 56 species that are currently assigned to the genus Phylloscopus, and another 12 assigned to Seicercus which, as noted above, is embedded within Phylloscopus from a biochemical standpoint. Our headline species — Chinese Leaf-Warbler (above) — is a Phylloscopus, one of several recently described species (e.g., Alström et al. 1992, 1997). So a whole lot of this family is composed of these leaf-warblers. Dickinson (2003) has a subfamily "Phylloscopinae" that might suggest the limits of this group, but it includes a variety of genera that proved not to be related. For example, both the monotypic genus Tickellia (Broad-billed Warbler) and the 3 species in Abroscopus proved to be members of the Cettiidae. All of the Phylloscopidae breed exclusively in the Old World, except for Arctic Warbler Phylloscopus borealis, whose range extends across the Bering Strait into northern Alaska. There are many species breeding at temperate and high latitudes in Eurasia that migrate substantial distances to winter in southeast Asia, India, or Africa. One of these in Tickell's Warbler (right). It breeds in scrub at high elevation in the Himalayas and on the Tibetan Plateau and then moves downslope and south to winter in the Himalayan foothills of India and Burma. It is an extremely active little warbler, and I rather shocked myself in obtaining this digiscoped image. The long distances traveled by Phylloscopus warblers present much opportunity for migratory mistakes and vagrancy. A few such birds will go the "wrong way" and become vagrants to western North America. I refuted one claim years ago ("Willow Warbler;" Roberson & Pitelka 1983) but recently an actual Willow Warbler was found as a vagrant in Alaska. I've had the good fortune to see both Arctic P. borealis and Dusky P. fuscatus warblers in California. Photos: The Chinese Leaf-Warbler Phylloscopus yunnanensis was singing at the top of a spruce at Wulsingham, Hebei Province, China, in June 2004. Blake Matheson photographed the Common Chiffchaff P. collybita at El Hondo, Valencia, Spain, on 14 Mar 2005. 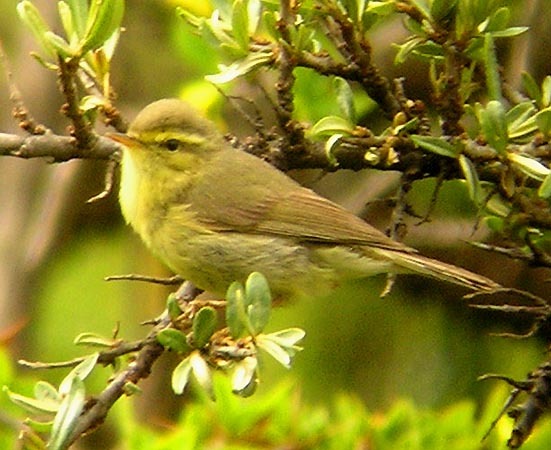 The Tickell's Warbler P. affinis was on breeding territory in Huzu Bei Shan Nat'l Park, Qinghai Province, China, in June 2004. All photos © 2006 Don Roberson, execpt the photo attributed to Blake Matheson, used with permission; all rights reserved. There is no "family book" covering the Leaf-Warblers so information must be sought in a variety of texts. The next volume of HBW will cover all the sylvioid warblers. Alström, P., U. Olsson, and P.R. Colston. 1992. A new species of Phylloscopus warbler from central China. Ibis 134: 329-334. Alström, P., U. Olsson, and P.R. Colston. 1997. Re-evaluation of the taxonomic status of Phylloscopus proregulus kansuensis. Bull. Brit. Ornith. Club 117: 177-193. Dean, A. R. 1985. Review of British status and identification of Greenish Warbler. Brit. Birds 78: 437-451. Madge, S. C. 1987. Field identification of Radde's and Dusky warblers. Brit. Birds 80: 595-603. Roberson, D., and F. A. Pitelka. 1983. 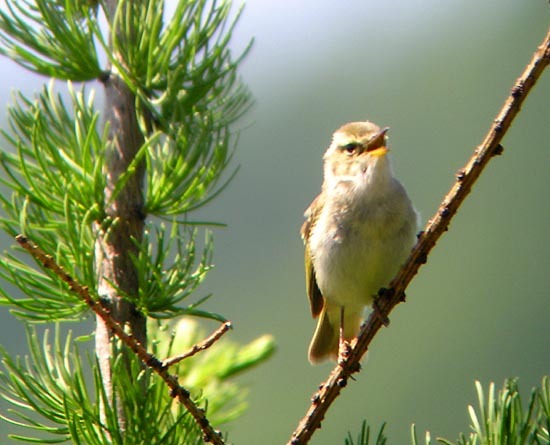 Occurrence of Willow Warbler (Phylloscopus trochilus) in North America refuted. Condor 85: 258. Ticehurst, C. B. 1938. A Systematic Review of the genus Phylloscopus. British Museum, London. Williamson, K. 1976. Identification for Ringers: The Genera Phylloscopus. Rev. ed. BTO Identification Guide 2. British Trust for Ornithology.